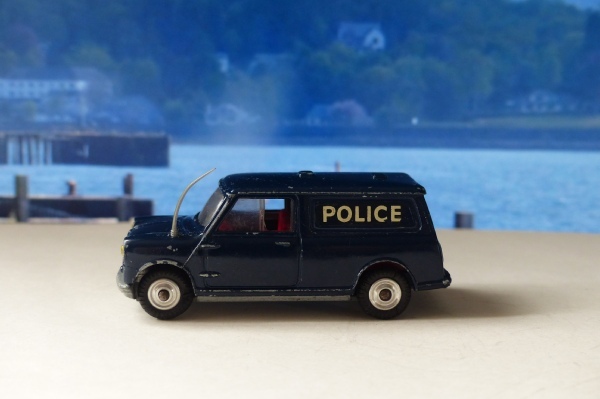 The normal mini van #450 in a nice shade of Police blue and with bars on the rear windows. In the box were a police dog on a lead held by a police handler in a nice scene set type of cardboard display. I had one of these but have no idea where either the car, dog or police chap went. Here is a model in pretty good condition. The paintwork is good and it has an original aerial and transfers. The jewelled headlamps are good and in place and there are two doors. One has been repaired but looks fine on display and still opens and closes. This was a small project to make one good model out of two and profits will go to acquiring one with cast wheels which is still missing from my catalogue!